The last time the Yankees and Astros played at Yankee Stadium, the Yankees hammered Dallas Keuchel, en route to a 3-2 ALCS lead. 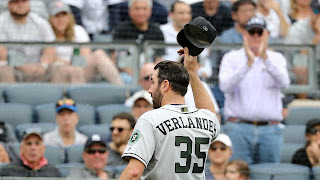 They entered today’s Memorial Day hoping for more success, but unfortunately Justin Verlander and the Astros had other ideas. Verlander once again dominated the Yankees, and the Astros took the first game of the series, 5-1. Domingo German looked good in the first inning, racking up a strikeout of Carlos Correa, but he ran into trouble in the second inning. After a single by Yuli Gurriel, a fielder’s choice by Marwin Gonzalez, and a walk by Evan Gattis, J.D. Davis drilled a three-run homer to left, putting the Astros on the board. The Yankees had an opportunity to score in the bottom of the inning, after a single by Gleyber and a hit-by-pitch to Hicks. However, Gleyber was picked off to end the threat. The play SHOULD have been called a balk by Verlander, but wasn’t. The Astros scored again in the fourth inning, as Evan Gattis picked up an RBI single after an error by Gleyber and a single by Gonzalez. German avoided further damage, as Gardner threw out Gonzalez at third, Davis struck out, and McCann grounded out, but the Astros had a 4-0 lead. Overall, German had a much better outing than his line indicated. His one mistake to Davis was a big one, but as the game progressed he attacked hitters more, and the Astros struggled as a whole. On the other hand, the Yankees were lifeless against Verlander. 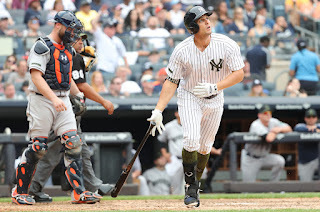 Their lone run came in the seventh, as Greg Bird launched his first homer of the year. That would be the only extra base hit the Yanks had in the game. Altuve homered in the eighth off of A.J. Cole to give the Astros a 5-1 lead. Ken Giles came on in the ninth and shut the door. On a positive note, Didi Gregorius had two hits, which hopefully could be a sign that his horrific slump may be ending soon. Bird also added a single in the ninth, and has looked very solid since returning.